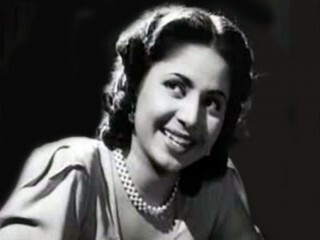 Geeta Bali(born 1930) was a popular film actress from Bollywood. Bali was born in a Mohyal family in pre-partition Punjab as Harkirtan Kaur, a Sikh. Her family moved to Bombay and were living in near poverty when she started to get breaks in films. Bali became a star in the 1950s. She had worked earlier with her brother-in-law Raj Kapoor in Bawre Nain and with her father-in-law Prithviraj Kapoor in Anand Math. Unlike other actresses who gave up films after marrying into the Kapoor family, Bali kept acting until her death. In 1955 she married Shammi Kapoor who was 1 year younger than her but not yet a star. She had two children with Shammi. She left behind a son Aditya aged 8 and a daughter Kanchan aged 3. She died on January 21, 1965 stricken by smallpox. View the full website biography of Geeta Bali.